Silk screen printing is a printing method where ink being printed directly onto the T-Shirts or apparels. The ink printed via silkscreen printing is durable and very long-lasting. They can withstand thousands of washes and the apparels that you customize with silkscreen printing can last for many years. It is our most popular method of T-Shirt printing in our business operation. 🔍 Are You looking for Silkscreen printing in Singapore? You are at the right place! We specialize in Silkscreen printing services in Singapore as well as custom T-Shirt printing & apparels. We know that you would have a lot of questions about Silk screen printing, especially if you’re new to this. ⚡ To bring you up to speed, we’ll address the Frequently Asked Questions (FAQs) about Silkscreen printing of T-Shirts & Apparels in Singapore. ⚡ Which Products Can You Choose to Silk screen? Screen silk printing is suitable for most types of products that we carry such as T-Shirts, Polo Tees and Hoodies as well. Most of our apparels that we use for silk screen printing is made from Cotton or Dri-Fit Polyester material. If you have products that are made from different materials, do check with our friendly sales team whether they are feasible for printing. ⚡ How Long is the Lead Time for Screen Printing of T-Shirts? This is our most frequently asked question that we receive on a daily basis. Silk screen printing process involves the making of ‘mould’ or ‘block’ which consist of the ‘screen’ in which ink will pass through to imprint your design onto the apparel. The making of this mould requires time, and therefore it is unlikely you are able to find silk screen printing services to be done in a few hours. At Meowprint, our lead-time for ink screen printing services is about 5 working days from the start of processing of our orders. We believe this is the sweet spot for timeline to allow our experts enough time to provide you the best quality printing for your apparels to give you your dream T-Shirts! If you require express printing services in Singapore, do get in touch with and we’ll let you know on the feasibility of your project! ⚡ Why Choose Us? Aren't All Screen Printing Services the Same in Singapore? This is what most people would like to believe. Are you ready for the Truth? In fact, it’s been the industry secret that there are different tier grades of custom silkscreen printing services in Singapore. You heard it first from us at Meowprint! Yes, do not be surprised! Just like any other industries, there has to be a reason why sometimes we pay more for better quality goods and services. This is because different quality printing services do exist in Singapore. As mentioned earlier, there are different quality grade for silk screen printing in Singapore. If you have engaged a vendor for screen printing of T-Shirt before, you may have encountered cracking or peeling of ink printing after just a few washes. Of course, it also depends on the quality of the products that we silk screen on. Products such as towels has high number of weaving and gap and may still face some cracking in the print. What is the difference between the 2 pictures? 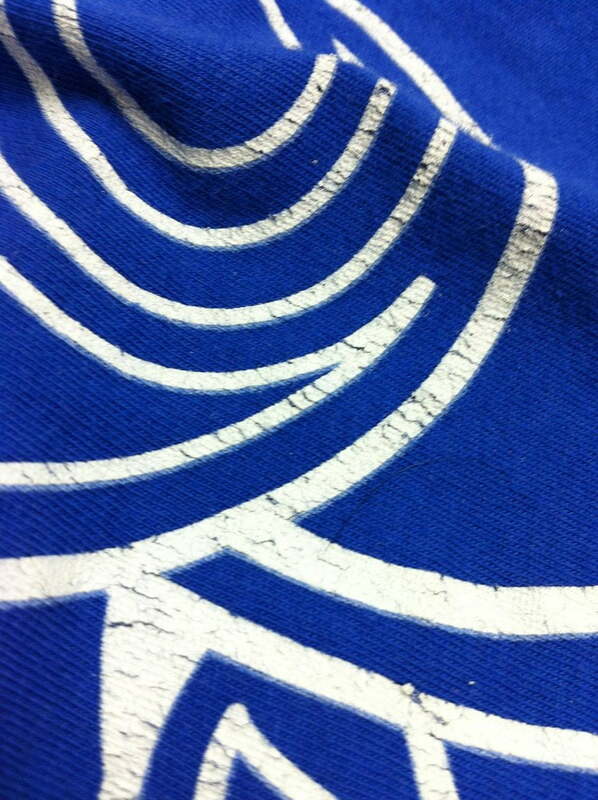 For basic grade screen printing, you can see the cracking of the printing of the T-Shirts, which is not durable at all. By default, we provide our customers with the Higher quality grade silk screen printing services because we believe quality is very important, giving you the Fresh out of the Oven ‘feel’ for your T-Shirts! This brings us to the next point about pricing for Silk screen printing. ⚡ Do We Provide the Cheapest Silk Screen Printing Services in Singapore? Since Day 1 of operation, it has always been our mission to keep our pricing affordable and competitive in the market. We are happy to announce that we are able to provide Higher quality grade silk screen printing services at a very affordable competitive pricing. We are probably the cheapest T-Shirt printer in Singapore! If you come across any other vendors that can provide cheaper option than us, do be sure to do your due diligence to check the quality of silk screening services that you’re getting. We believe we provide the best quality printing service in Singapore! Our customers love their printed T-Shirts and they provide us with their own genuine reviews. You should be brought up to speed by now! Do let us know how else we can assist to get your started on your custom printing project! As mentioned previously, silkscreen printing is the most popular method of printing due to its features. What makes this method of printing so popular, you might wonder? Well, this whole page on silk screen printing is all you need. If you’re passionate about screen printing, let’s explore further into its origins and the processes involved. How did Silk Screen Printing come about? Which products are suitable for Silk Screen Printing? 1. How did Silkscreen Printing come about? Before we learn how does silk screen printing is being carried out later on in this article, I will share you an insight to where it all began. Believe it or not, this method of printing first surfaced in China. However, the process of silk screen printing might be very different to what we are accustomed to. The form of silk screen printing that we know as of today, was discovered by a young painter by the name of Samuel Simon from Manchester, England. He was studying the screen printing processes in its early stages from China and figured a way to use the method to revolutionize his business. Talk about being enterprising! Read more about the history of silk screen printing. Silkscreen printing is a printing method similar to a stencil. It is a process that transfers a design onto a product also known as the substrate through a screen, hence the name, silkscreen printing. 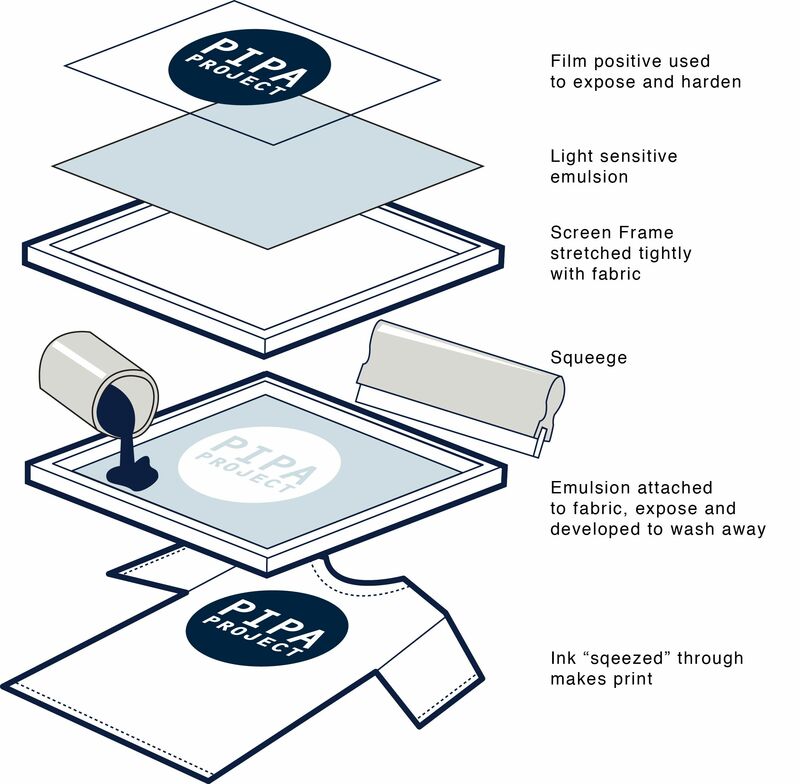 Ink will be transferred through the screen onto the product, such as T-shirts or Polo T-Shirts. More products can be found via our product catalogue. Firstly, a screen is required. The screen is made up from synthetic polymer, such as nylon, forming a mesh stretched over a frame. Depending on the complexity of the designs to print, different mesh of different aperture of the mesh can be used. The rule is, the more detailed the design is, the finer and smaller aperture of mesh has to be used. The most important step is to ensure that the mesh must be mounted on a frame under tension. If it is not under sufficient tension, it will not be an effective mesh. Next, we have to create a stencil of the negative image of the design that you wish to print. This is done by blocking off areas on the screen. The unblocked areas will be the design that you wish to print since the open space will allow the ink to flow past the screen and onto the products. We will go in depth about stenciling technique later on in this article. Now that we know the basis of silk screen printing, we can move on to the technical details of the technique. Before we can proceed to print, we must first coat the screen and frame in a photo emulsion. We will then proceed to burn away the unblocked areas using a bright light. Now we have a perfect screen with the desired design to be printed. Can we print on any flat surface? The answer is no. The surface in which silk screen printing method uses is usually called a ‘pallet’. The pallet has to be coated with a wide tape. The purpose of the tape is to protect the pallet from any leakage of unwanted ink onto the substrate. We also have to line the screen and frame with a tape as well. The tapes to be used will vary depending on the ink that is used in the silk screen printing process. Most of the time, tapes are used when Ultraviolet (UV) or water-based inks are used. This is because these inks have lower viscosities. Last but not least of the pre-press process, we have to ensure that any unwanted holes in the emulsion have to be blocked. This is to ensure that unwanted ink will not flow through to destroy the artwork. Tapes, specialty emulsions or block-out pens can be used effectively to block out the unwanted holes. Summary of the different steps involved in silk screen printing process. Now that the pre-press preparations are completed, we can move on to the process of silkscreen printing. Prepare your substrate on the pallet. In this case, we will use t-shirts as the substrate for easy explanation. Place the screen on top of the t-shirt. We will then place the ink on top and on one side of the screen. A fill bar will then be used to force the ink through the mesh of the screen. At the start of the process, the printer’s starting point will be at the rear end of the screen behind a puddle of ink. The printer will lift the screen to ensure that there is no contact with the t-shirt. The printer proceeds to pull the fill bar to the front of the screen by applying force in the downwards direction, filling up the mesh openings with ink. Next, the printer will then use a squeegee (rubber blade) to move the screen in contact to the t-shirt and then pushing the squeegee back to the rear of the screen. During this process of pushing the squeegee back to the rear of the screen, the ink that filled up in the mesh opening is squeezed onto the t-shirt in a controlled manner via a capillary action. The thicker the mesh, the more the ink gets deposited in the mesh opening. Once the squeegee reaches the rear of the screen, the tension of the screen will cause it move away from the t-shirts, also known as ‘snap-off’. The end result is that the ink will be printed upon the t-shirt surface. There are 3 types of common silk screen printing presses. They are known by ‘rotary’, ‘cylinder’ and ‘flat-bed’. Now that you know how the process of silk screen printing works, how about designs with multiple colors ink? It works the same way, except more cycles of the printing process repeatedly depending on the number of colors. This can be done via the wet on wet technique or having intervals during printing for drying up process before printing the next color. Screens will need to undergo re-coating of the emulsion . However, sometimes ‘haze’ gets left behind in the screen once emulsion is removed. These form the outline of the previous stencils because sometimes ink can get trapped in the mesh. To remove this, an extra step called dehazing can be applied. Earlier on in this post, we have briefly mentioned in creating a stencil in the pre-press preparations. Now we will cover the method of creating a stencil using the photo emulsion technique. Firstly, we have to have a high resolution image of your design, preferably in the 300 dpi. Next, we have to create the image on a transparent overlay via several methods. ie drawing, paint, or most commonly printed. We have to ensure that the design on the overlay is not transparent. We will then proceed to create a screen with a mesh which can be used depending on the complexity of the design, and then coat it in photo emulsion. Carefully place the image overlay we created on the screen and then exposing it to a light source containing UV light in the 350-420 nano-meter spectrum. We will wash off the screen and the areas that is not exposed to the light source (ie the negative image of the design) will remain on the mesh. Now, if you are still very confused about the method of printing, fret not! Watch the video below and understand further. Awesome! Very technical indeed we have come in this article. By now, you should be a beginner in how the preparation process of silkscreen printing works. By understanding the mechanism of the printing process, you can guess the advantages and disadvantages of this printing method. Let’s see how many you can guess correctly, by viewing the facts below. Here’s a list of the pros and cons of silkscreen printing method. This list is not exhaustive, but they are sufficient for you to make a decision on the method of printing you should use. The start-up costs is spread across quantity, hence, it is very cost efficient for printing large quantities. For example, if the costing is $100 the ink printing, it’ll be $10/piece for quantity of 10 t-shirts. However, for the same price for 100 pieces of t-shirts, it’ll be only $1/piece. This is just a simple analogy for your understanding. There is usually a minimum costing per colour because of the screen being used. The ink that is imprinted on the apparels or products is very long lasting, and can last many washes. Due to the the advancement of technology, latest automatic presses can print up to over 2000 t-shirts in an hour by a single man also known as the operator. Of course there is no perfect method of silkscreen printing that is far superior to other kinds of methods. If you are looking to print a small logo print of 2-4 colours, then you could check out embroidery. The start-up cost is lower for small quantities. Below are several disadvantages to take note of. Most are the opposite of the advantages. Since the start up costs is spread over quantity, it’ll be very expensive for low quantities, for example, below 10 pieces. Every color of printing requires a new screen. Therefore, every color of printing adds on to the start-up costs. Therefore, can get very expensive for complex design printing with many colors. This method of print is not suitable for designs with gradient colours. This printing method is meant for designs with solid colours only. If you need gradient coloured printing, check out our digital heat transfer printing or DTG printing. Silk screen is not cost effective to print individual names & numbers for jersey. You could check out Vinyl heat transfer printing to print individual names/numbers. The above points should sum up your decision to see if silk screen printing method is the best method to print your current designs. We have passionate and professional crew to meet your needs. For silk screen printing, we recommend at least 20 pieces for printing to be quoted an affordable pricing. Since this printing is for solid colors only, it is more suitable for designs between 1-4 colors per design. If you are not entirely sure about this printing method, do head over to other kind of t-shirt printing services and explore if there are better options. If you are looking for all over printing, silkscreen will not be sufficient, but Sublimation printing might meet your needs. 6. We can provide Silk screen printing services for the following Products from our catalogue. All Outerwear except Windbreakers Corporate Jackets. As mentioned earlier, silkscreen printing method is popular among our customers, which is why we incorporate it into our Instant Quotation pricing. There are many who may not understand what silkscreen printing before this article, but you should know the basics by now. If not, feel free to scroll up to the earlier part of this post. By understanding the mechanics of silkscreen printing method and studying the past sales data from our customers, we notice that many of them have a quantity of at least 20 pieces and also wants the cheapest alternative. We also received feedback that they might change their quantity but the printing remain the same. In addition, receiving quotations from many vendors creates a delay in their day-to-day business operations. To solve that problem, we have incorporated 1 color logo printing into our Instant Quotation on our catalogue, mainly for t-shirts. This transparency not only gives our customer trusts that we believe our pricing are very competitive, but at the same time, boosts their efficiency by removing the delay out of their operations equation. What is 1 (one) color Logo T-Shirt Printing? 1 (one) color logo printing simply means that your design will be printed in 1 color ink. The image below is an example of a corporate logo being printed in only 1 (one) color logo printing converted from the original 4 colors logo print. By converting the original 4 colors logo into 1 color logo, you save on your customization costs. In addition, increasing your quantity into bulk printing will increase your savings! We hope by reading this article, you have a better understanding on silkscreen printing and how you can save costs to enjoy cheap t-shirt printing customization with us! If you need complex silkscreen customization in bulk quantity, you can try out our custom-made T-shirts services. You can also check out our recent projects on silkscreen printing below for your reference.